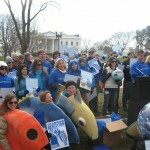 From March 7 to March 10 of 2009, the second Blue Vision Summit gathered some four hundred people from over two hundred ocean organizations in Washington DC, ranging in size from a two-diver outfit working on removing abandoned fishing nets off the sea bottom in California to the National Geographic Society, New England Aquarium, UNEP and Google. With two days of speakers and panels on Federal ocean action, evening ‘Celebrations of the Sea’ and a Capitol Hill Day on which participants met with their representatives, the first ripples were made in a tidal shift of US ocean policy. Blue Frontier Campaign, Khaled Bin Sultan Living Oceans Foundation, Pew Environment Group, Project AWARE, Oceana, Natural Resources Defense council, The Curtis and Edith Munson Foundation, Care2.com, The Nature Conservancy, Environmental Defense Fund, Clean Ocean Action, The Ocean Foundation, Surfrider, National Geographic, The Henry Foundation, Ocean Champions, The Baum Foundation, International Fund for Animal Welfare, Massachusetts Ocean Partnership. Dr. Roger Payne (Keynote Speaker), Dr. Sylvia Earle, Nancy Sutley (CEQ Director), Representative Sam Farr, Senator Sheldon Whitehouse, Mike Chrisman (CA Secretary of Resources), Marine Artist Wyland, Bill McKibben, Jim Toomey, David Helvarg, David Guggenheim, Thomas Lovejoy, Carl Safina, Philippe Cousteau.